These posts are all about raising my purebred Dalmatian puppy Quest. But there are many different routes you can take when getting a new dog. I searched and interviewed over 40 breeders before I found Linda McSherry at Patch Mountain Dalmatians. I was determined to get a puppy from a quality breeder who was willing to work with me to select a puppy with the most potential for what I was looking for. I also new that bringing a puppy home before 12 weeks was very important for the Imprint period and development of confidence. American Guide Dogs for the Blind identified that 90% of puppies enrolled in their program who left their mother and siblings for their forever home on or before 12 weeks graduated as successful guide dogs. Only 30% who stayed with their mother past 12 weeks made it. Leaving the nest before 12 weeks is important due to the stage of puppy development the pups are in and the stimulation they get outside the confines of the world they have become accustomed to. The importance of this early socialization experience is one of the reasons I started my own Puppy Classes. Half of each class is devoted to play and socialization and we push for people to enroll their puppies as soon as possible. There are so many things a breeder can do to help the puppy develop stronger and better adjusted. Even making sure the mother is taken care of while pregnant can help her deliver puppies who are less anxious and more interested in human companionship and contact. Puppy Culture – Hands down the BEST DVD I have seen about having and raising puppies. The first 12 weeks of a pups life has a GIGANTIC influence on the dog they will grow up to be. This 3 DVD set is super comprehensive, informative and should be a mandatory watch for anyone even thinking about having or getting a puppy. 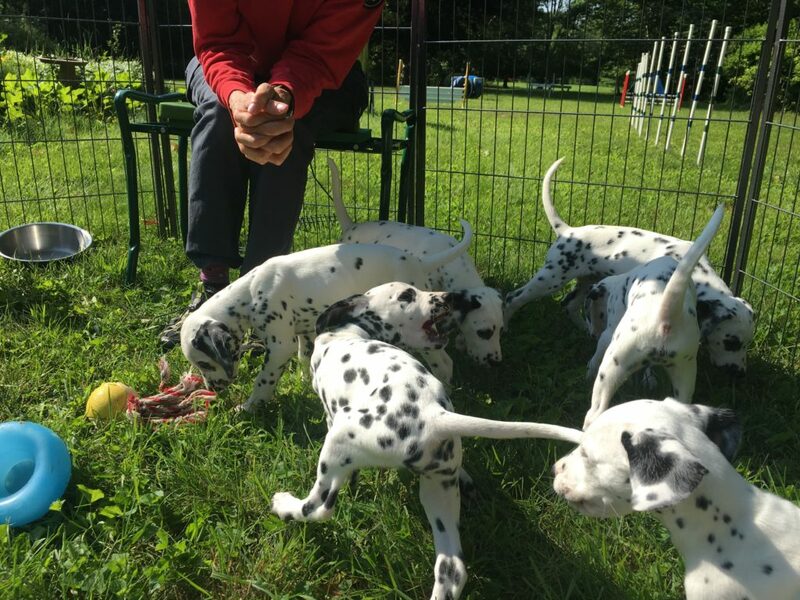 What Makes a Good Breeder guide from the Dalmatian Club of America. Great info no matter what breed of dog you want to get. Questions you should ask when searching for a breeder. Questions a good breeder should be asking you. If you speak to a breeder and they don’t ask questions like these, that should be a big warning flag. Look for someone who does. Patch Mountain Dalmatians – I couldn’t really have a list of links without adding Linda’s kennel.